(NOTE: THIS NEW 2014 EDITION MAY TAKE SEVERAL DAYS TO GO ON LINE AT AMAZON? I have just completed updating my past two years of ongoing investigation into the 1940s Los Angeles Lone Woman Murders as originally presented in the 2012 publication of Black Dahlia Avenger II. In addition to the new evidence and linkage further connecting my father the the many crimes BDA II 2014 has undergone a complete editorial revision. To that end, I would like to here take the opportunity to thank and praise my editor, veteran journalist and bestselling author, Ron Franscell. Ron took on the challenge and using his editorial brush (made of steel) scrubbed down every chapter in both the original 2012 and this 2014 updated edition. Ron manged to free the seaweed from the propeller as well as knock off all the clinging barnacles which held fast to the book’s hull. A miraculous cleaning fore-and-aft/stem to stern. Book Dr. Ron comes highly recommended. Go to school on me--always use an editor. And, in my book, they don’t come any better than Ron Franscell. See his author/editor-book-doctor webpage here. I would also like to thank and give high praise to the remarkable work done by Aubrey Hansen, author, screenwriter and book-formatter extraordinaire, who completely redesigned BDA II’s interior which included her artful selection and insertion of much improved fonts as well as the massive reorganization, positioning and replacement of 576 pages of text and over 300 photo-exhibits. Thank you Aubrey for a difficult job WELL DONE. Black Dahlia Avenger II 2014 revised edition is now available in both print and eBook formats. Myth No. 3 – “The case was never solved. 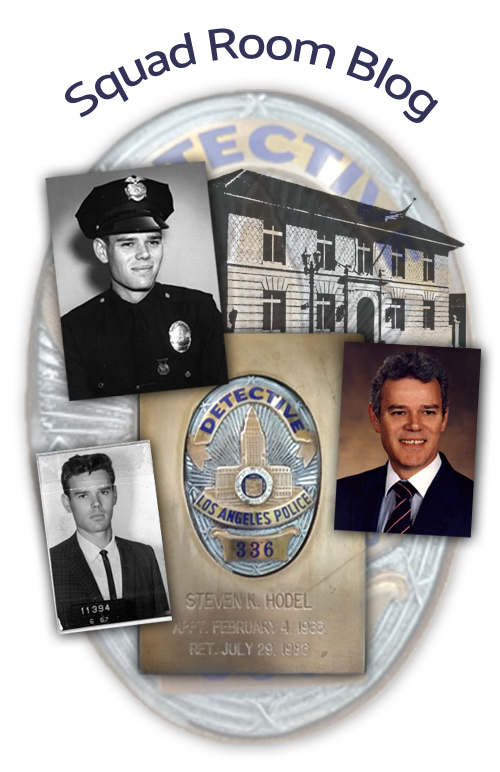 • The obtaining of Dr. George Hodel’s full DNA PROFILE which can now be made available for law enforcement testing and comparison to multiple cold case unsolved crimes. • Discovery of the Hollywood residence where the BLACK DAHLIA MURDER was committed along with physical evidence connecting the killer to the house and to the vacant lot where he later transported and posed the victim’s surgically bisected body. • Identification of “The Baron,” George Hodel’s house-guest and accomplice overheard by detectives discussing “crimes and payoffs” on the 1950 DA bugging tapes. • A World Class Surrealist Photographer reveals his firsthand knowledge of the crimes.• Over 300 photographs and crime exhibits including the 1969 Sowden House 17-Photo Historical Survey. Five New Chapters  containing: crime scene forensic results; new evidence advancing the “Murder as a Fine Art” crime-signature; newly discovered LAPD physical evidence that may yield potential suspect DNA and a 2014 biometric facial recognition analysis and comparison to known victim photographs. I will buy the book and read it, I’ve read all. You are right, I believe about everything. Good work, Steve. I’d say that discovering new information on a and adding this to what has you have already, is a mark of a dedicated detective and mystery writing. You are the best.! Looking forward to when I can purchase the new book. This looks highly detailed and great. I’m sure your multiple years of work can bring help to many of the victims and their families. Thank you very much! Best wishes! Hi Kathy: Just approved the print and eBook new versions so may take 12 hours or so to post on Amazon? I’m looking forward to reading this one and adding it to my collection of your previous books. Hi Walt: Thanks for the support. Hope you enjoy the updates. Lot of new material. I was and still am amazed at the through research you’ve done. You have me convinced of your fathers guilt. And the connection to Man Ray is amazing. I will get this new book, I love your writing, I feel that you have a gift of research and seeing things that other people cant see. Denise: Thank you for the kind words. Much appreciated. I think you will find the new Man Ray Nexus fascinating. I know I did. Just bought it on e-book for Kindle. Cant wait to start. Awesome, thanks for the e mail, I will be picking this up! Have all your other works, and love how in depth you have researched everything. Just read the updated BDA II. One of the things that really struck me is how mindbogglingly uncooperative the LAPD has been with you re DNA testing. Maybe this sounds naive, but do you think some sort of social media campaign to raise awareness and apply pressure might help? Mr. Hodel, I already purchased BDAII from you, so I was wondering if there will be an option to buy the new chapters as an e-book or something, so I don’t have to shell out for the book a second time? Kris: Go to the below link on the BDA II 2014 edition. I think they only charge $2.99 if you purchased the print ed. Let me know how it works out. The new chapters are fascinating. It’s frustrating that the police are slow to communicate and do the DNA testing. Or at least be clear about what testing they have done! Glad to hear Buster is doing well on three legs. That’s just amazing he can detect cadavers after decades have passed. It’s a fascinating, horrific saga. Your content is always in depth and fully explained. It makes it easy for a casual reader to follow. The new editing is great. It adds considerably to the readability. That sort of thing always is a key component for how readers decide on a book’s authority, too. I bought the first edition of BDA II as the printed book. I bought this updated edition for Kindle. For what it’s worth, there are missing photos in the “Touch DNA” chapter. Also the red type throughout the book sometimes appears and disappears in text in a confusing way. I don’t know how easy it is to update a digital product. Thanks for the new installment in this ongoing mystery! Steve, after reading your books and listening to your radio interviews, I can’t imagine a more thorough investigation and not only did you identify the killer, you independently corroborated the investigative findings of Lt. Jemison who was contemporary to the crime. It’s sad that both you and Jemison have met the same resistance of LAPD, who seems to confirm that the more things change the more they stay the same. What good are Parker’s reforms to a police department that picks and chooses the crimes they want to solve? If they are truly interested in public confidence, they will take the investigative work that was performed both then and now and close the Black Dahlia case among other cold cases. I hope both you and any remaining survivors of the victims can take solace in that, regardless of the state of law enforcement, there are always people like Jemison and yourself who live up the lofty ideals of police work. You and Jemison have convinced me of that reality, and you spoke very eloquently on Jemison’s behalf. The impact of this latest installment (2014) to me is that I do not know George Hodel as well as I did before this most recent read. I look forward to any light you can shed in the future on what compelled your dad to commit these crimes. One reason the Black Dahlia investigation has intrigued me is timing. My dad died perhaps a couple of weeks after yours did. I think we always find out things we didn’t know that disturbs us posthumously, but I can truly say you got the worst of it. The fact that an honest cop with service first and foremost on his mind evolved from that troubled family situation provides me with a lot of hope for better law enforcement in the future. The truth and relief for the victims has a future, and that’s what you have represented these last 15 years in distinguished fashion. Congratulations on a job well done, and keep the light on for truth and justice! I have read all 3 of your books and am completely convinced that your father commuted many, if not all of these crimes. As an attorney, I agree with the DA who said if your dad was alive he could convict him on the Short murder and at least one other. Your books got me so interested I bought another by William Rasmussen, who also ties the Short murder to the Zodiac, the Degnan murder, the lone woman killings AND the Cleveland torso murders. Have you ever looked at those murders as possibly being linked to your father? I know that several were found in water and the killer seemed to have a thing for the heads. I assume you are well aware of these murders yet never mentioned them. Just wondering if you had eliminated your father as a suspect, possibly by putting him in another location? Keep up the good work.